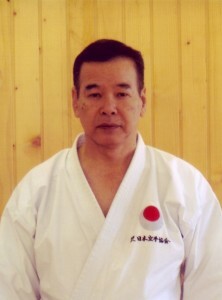 Master Ueki Masaaki who succeeded the second chief instructor Sugiura, and inaugurated as the third chief instructor. Since high school, he studied under Master Sugiura(the second chief instructor), then went on to Asia University. Soon after graduation, he joined the Japan Karate Association as the sixth trainee and achieved excellent results in numerous competitions. As the head instructor of the headquarters, he was devoted to the development and instruction both within and outside Japan. He served as executive director since July 22, 1995 and greatly contributed to the development of the Japan Karate Association. He was inaugurated as the third chief instructor on May 29, 2010 and continues his work today. Studied under Kimonenba Dojo (now, Koganei Branch) Master Sugiura.